Agios Nikolaos (Άγιος Νικολάος) is a picturesque harbour town on the north coast of Crete which is considered to be the centre of tourism for the east of the island, having a reputation of entertaining visitors for over forty years. Standing on the northwest shore of the Bay of Mirabello, it gets its name from the 7th century chapel of St Nicholas. The surrounding area is noted for its sandy beaches and beautiful bays. A landmark feature of the town and standing at its centre, at the base of a cliff, is a small circular lake, known as 'Voulismeni'. The area of the lake features a small park with a walking trail, an open air theatre, views of traditional fishing boats and resident ducks and pigeons always happy to be fed by passing visitors. The mythology surrounding this lake, states that the goddesses Athena and Artemis used to bathe here. The depth of the lake has been measured at 64 m. It was connected to the sea only recently, with a small canal which was opened in 1870. The lake is a great place to sit and relax with many opportunities for refreshment. The climate of the area is warm during the spring and summer months, and very mild during winter, making it an ideal destination at any time of the year. There are several small beaches around the town including beaches in the heart of town with facilities for sunbathing, a children's swimming pool and a playground. Those in town include: E.O.T. ; Amos, very central and good for watersports and diving; Ammoudi, small sandy beach in the town with all necessary facilities; Kitroplatia, a sandy beach close to the centre of the town. On the outskirts of town there are more beaches. Almyros, is a long sandy beach situated to the the south of the town, two kilometres along the road to Kalo Chorio. The whole area of Almyros is wooded with eucalyptus trees, reeds and rushes. A fresh water river meets the sea here. The area is an important nature reserve and excellent birdwatching area. The beach has all the necessary facilities. One kilometere away on the coast road to Elounda is Havania, a large sandy beach with all necessary facilities. All the beaches have been awarded the Blue Flag status. The tiny island of Agios Pantes lies just off the coast and is home today to a small flock of the protected species of Cretan wild goat known as the Kri Kri. Agios Nikolaos is the administrative and commercial center of the Prefecture of Lasithi (Nomos Lasithiou) since 1904. The Municipality of Agios Nikolaos, which includes the town and its surrounding villages, had a population of around 19,000 inhabitants in 2001. Its own population is estimated at around 8,500. The town has an interesting history. During the 2nd century BC, the Dorian inhabitants of Lato he Hetera, abandoned their inland town on the mountainside above Kritsa and created a new settlement. 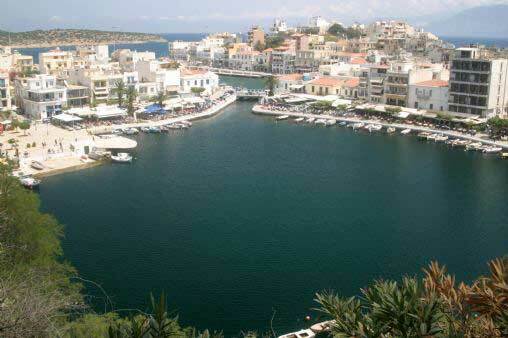 Today the modern city of Agios Nikolaos stands on the site of this Dorian harbour town. Agios Nikolaos continued to be an important harbour town during the Roman occupation of Crete and during the first Byzantine period. The Venetians built the Mirabello Castle on the site where the modern Prefecture building now stands. There are no surviving remains of the fortress. When the Venetians constructed a new port in the Elouda area, the harbour of Agios Nikolaos became less important. The 7th century Byzantine Church of St. Nicholas was erected in an area known as 'Nissi'. The church features a bell tower, drum and dome and has several well preserved frescoes some of which date from the 8th century A.D. It commands an excellent view overlooking the town and the Gulf of Mirabello. Saint Nicholas is the patron saint of sailors and of Greece. The Name Day of the church is celebrated every year on December 6th. As well as the natural charm of the town itself and its facilities, visitors will find many events organized by the Municipality including cultural, music and dance events, exhibitions such as the Floral 'Isis' and theatrical performances. Naval week also offers swimming events, water skiing and wind surfing contests. There is a weekly market here every Wednesday. Agios Nikolaos has a fine Archaeological Museum, displaying many archaeological finds from the Prefecture of Lasithi. Agios Nikolaos has a large range of facilities both day and night time and accommodation of all types. It has facilities for many sports and exercise facilities in addition to watersports including athletics, football, volleyball, basketball and tennis. It has a variety of shops selling everything from Cretan art, jewellery and locally woven and embroidered items to locally made copies of archaeological museum exhibits and Byzantine icons. Capital of Lassithi Prefecture, Agios Nikolaos is easily accessed from the National Road, which passes close to its outskirts. It is approximately 66 km from Heraklion and 70 km from Sitia on the north coast and 36 km from Ierapetra on the south. There are ferry connections from Agios Nikolaos for the ports of Piraeus (all year round), Sitia and Aegean islands of Milos, Santorini, Karpathos, Kassos, Kos, and Rhodes the Cyclades and Dodecanese. Agios Nikolaos is accessible from mainland Greece and the whole of Europe through Nikos Kazantzakis Airport at Heraklion.